This situation requires the creation of links between the different approaches of the ministries involved. This example is a positive one, even if it remains “Top/Down” in the nature of its approach, and not “Bottom /Up” (Future Basin). Quantitative studies on water have been repeated 3 times since 1915. 2.C.1.2. Why is there a the lack of generalization to the rest of Australia? Figure 23 : The Water Act 2007 and the oversight of some basin plans. Why not the entire country? 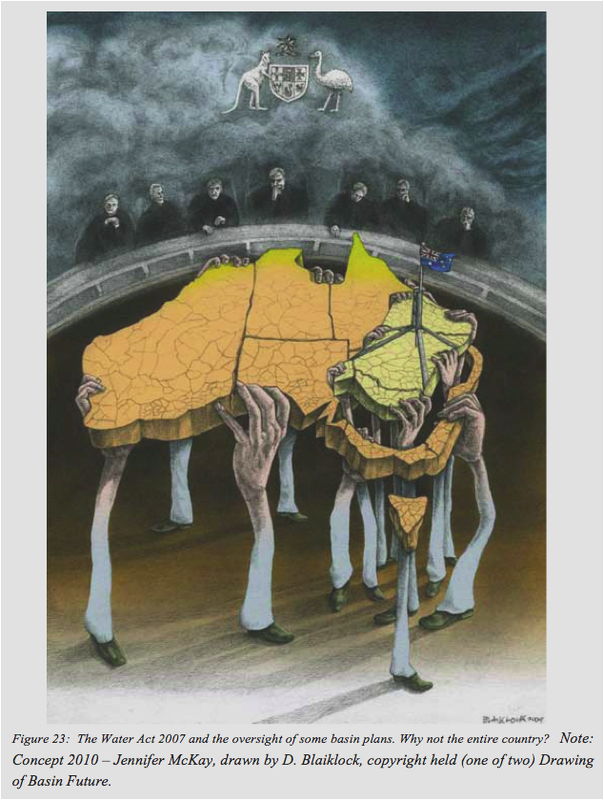 Note; Concept 2010 – Jennifer McKay, drawwn by D. Blaiklock, copyright held (one of two) Drawing of Basin Future. This study highlighted the most important research initiatives, planning projects and processes outlined in the context of a broader concern to ensure that water planning and decision- making processes are developed appropriately and take into consideration the whole range of social, cultural and economic issues. The research and project initiatives which are described in this report should also be considered as being part of a long history of activities related to water in the North of Australia. This extensive body of work highlights the intimate relationship between the values of water and water management. The variable and dynamic values related to water, as well as beliefs and customary practices, all influence the use, the quality, and the flow of water. In turn, these values, beliefs and practices are influenced by the way in which the water is and continues to be monitored. This review of projects and research activities also reveals that the water in the North of Australia has environmental, social, economic, cultural and security dimensions. These water- related values, beliefs and practices are part of a complex network of local, national and international groups. It is therefore perhaps not surprising that decisions made as to which sector will have to bear the costs, benefits and impacts of water-dependent development are crucial and controversial issues for hydraulic planning in North Australia. The projects carried out to manage these rivers were undertaken through a diversity of Australian and international interest groups and funded through a range of governmental and non-governmental programs. The complexity and the diversity of interests and management activities existing in these Northern Rivers highlight the multi-scale dimensions of water governance in this region. They also suggest that the Northern NWI models (National Water Initiative) of integrated water planning may have to be adapted.. 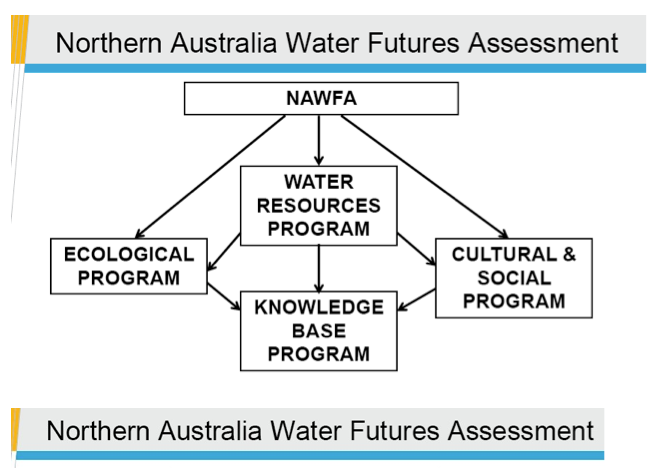 The recommendations for research on the social and cultural dimensions and on water in the North of the Australia were not included in the terms of this review. Comments on the preliminary version of this report from researchers and practitioners engaged in issues of water in the North of the Australia revealed a high level of interest in the social and cultural dimensions of water and water planning in many regions. A key message in this feedback was the need for Aboriginal and non-Aboriginal groups to review, reflect and refine research priorities in this area. This can help inform a body of knowledge to ensure that water resources in the North of Australia are developed and protected in a way that is ecologically, culturally and economically sustainable. The development of “scenarios” clearly indicated that the amount that the respondents should expect as a compensation for damage, exceeds the amount they would be willing to pay to avoid the development to go ahead. This would suggest that it is in the interest of decision-makers to discuss (and if possible, to negotiate) the development options with the concerned stakeholders BEFORE development occurs. Compensation after the event could prove to be much more expensive. The NWI (National Water Initiative) stresses the importance of community consultation and public participation, and this research provides clear evidence that this involvement and commitment are financially sensible inasmuch as they are an important part of a transparent management of water. Those who try to save money by avoiding the costs associated with the implementation of appropriate consultation processes run the risk of having to pay even more in the subsequent period’s when/if the injured residents seek “compensation” for the actions taken without any consultation. Finally, it is important to note that the values of residents can differ, sometimes significantly, from the value of non-residents. This may generate conflicts – particularly in situations where non-residents are able to influence the decisions and the planning processes – and this raises an important ethical question: should there be a disagreement, whose values should be given more voice? Relying exclusively on the techniques of dollar-cost assessments to help answer this question, we – even unconsciously – give a greater voice to the ‘rich’ rather than to the ‘poor ‘. And this may, by extension, give more voice to the non-residents than to the residents (who often suffer from considerable socio-economic disadvantages – most particularly Aboriginal residents). Obviously, it is important that planners use more than simple dollars when seeking to assess and/or repair the many compromises related to the use of tropical rivers in Australia. The comparison between the 1.3 m km2 of Northern Australia and the 1 m km2 of the Murray Darling Basin. The major aquifers versus the catchment areas, and the revealing of a new frontier of development (of colonization…) for the North of Australia. Figure 24a and 24b : Richard Cresswell, River Symposium 2009. Following the November 2006 Summit on the southern Murray-Darling Basin (MDB), the then Prime Minister and Premiers of the States which were going to be affected by future plans for the MDB commissioned the CSIRO to carry out an assessment of the sustainable yields of surface and underground water systems within the MDB. The project became an international benchmark for a detailed and rigorous assessment, at the scale of the basin, of the projected impacts caused by climate change, by the development of the catchment area and by the increase of groundwater extraction, on the availability and use of water (ref. resources NASY p. iii). On March 26th, 2008, the COAG (Council of Australian Governments) decided to extend the appraisals of sustainable performance of the CSIRO so that, for the first time, Australia could have a comprehensive scientific assessment of the water yield in all major hydraulic systems across the country. The goal is to provide a coherent analytical framework for water policies across the country. The project of sustainable yields in the North of Australia, as well as similar projects in Tasmania and southwest Western Australia, aim at expanding assessments on a national level. 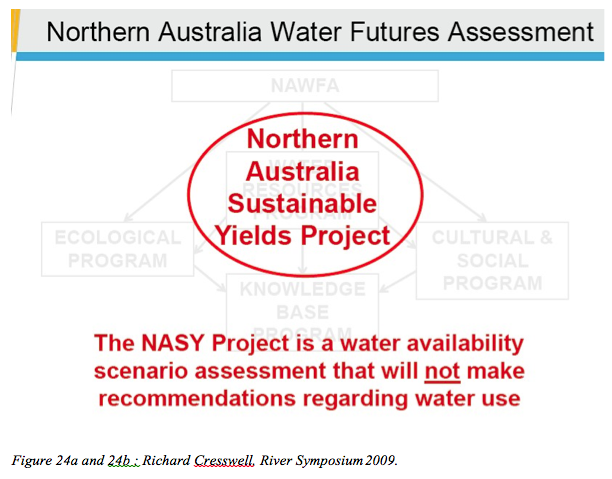 The project of the CSIRO of sustainable yields in the North of Australia provides essential information on the current and probable future water availability. This information will help governments, industries and communities alike to take into account the environmental, social and economic aspects of the sustainable management and use of the precious water resources in the North of Australia. These projects are the first rigorous attempt for these regions to assess the impacts of the development of the catchment area, of the extraction of groundwater, of climate change, anticipating climate change impacts on water resources across the whole region, by taking into account most particularly the connectivity of the surface water with groundwater systems. To do this, the most comprehensive hydrological modelling ever attempted in the region is undertaken, by using rain-flow models, models of recharge of groundwater, models of river systems and groundwater models. All the upstream-downstream and surface- subsurface connections will be taken into account. The Fitzroy region (WA) experiences high fluctuations in inter-annual rainfall and therefore, as a result, high variations in inter-annual runoff water and groundwater recharge. Compared to the rest of North Australia, the coefficients of variation are among the highest of all the areas and reflect several consecutive years of average rainfall well below or above. Rainfall in the region is very seasonal, with 93% of the precipitations falling during the rain season, between November and April, and a highly dry season from May to October. The intensity of the rainfall can be relatively high, and this is reflected in the rapid runoff and the short time period between the rainfalls and the runoffs. 97% of the runoff occurs in the months of December and April. There was a slight increase in the quantity and intensity of rainfalls over the period from 1930 to 2007. There is a strong North-South gradient of rainfalls and runoff waters as well, with a runoff coefficient decreasing from 25 to 30% in the same direction. The recent climate record (1996-2007) is significantly statistically wetter than the historical record (1930-2007). The rainfalls were 31% higher; the runoff was 53 per cent higher. It is likely that the future conditions (around 2030) will be similar to the historical conditions and the future runoffs and recharges will also be at these historic levels, but less than in the recent past. There is little opportunity for surface water storage, except in the more humid upstream areas in the East. Major floods prevail in the storage sites in the downstream areas, while estuaries are affected by very strong tides. The deep aquifers of the Canning basin constitute the largest water storage, except in the East, but limited data implies that the quantification of this resource is not possible. The more shallow alluvial aquifers are characterized by a thickness and a quality of groundwater which is variable and limited in quantity as a resource for the refill of the river. It is a relatively undeveloped groundwater resource. There is a complex interaction between surface water and groundwater; the river valleys are often flooded during the wet season and the region is dependent on groundwater during the dry season. During the dry season, billabongs retain their water levels through subsurface flows, with sand banks to support the river. From an environmental point of view, floods are heavily affected by the flows experienced during the rainy season. Dry season flows represent only a small fraction of the total annual flow. However, the environment is adapted to these seasonal fluctuations and any significant changes in the frequency and the duration of the high flows of the wet season and the low flows of the dry season are likely to have an impact on the environment. In the recent past, there have been a lot more floods, with fewer days of low flow and more days of high flow than observed in historical data. The annual and seasonal flows should not change much in the future median climate; so there is little change in the flow threshold in the high or low limits. On the other hand, the modelling predicts major changes in the extreme thresholds of the wet season high flows, the dry season low flows, which could be exceeded in extreme cases of future climate predictions. This could also have negative impacts on the environment. An analysis of the measurements of the high flows specific to Camballin Dam showed that fish movement opportunities were more frequent in the recent past and would be limited under an extremely dry climate in the future. The region is generally data-poor. Regional data is insufficient. These results are understood within a minimum mesh size of 29 km2 (basic unit of modeling). Since 2009, no other general survey and no detailed studies across the Fitzroy River Catchment have been conducted. A participation took place in 2010 for the establishment of a regional water planning organisation for 2010-2030, but only on the basis of existing data. Planning in the Kimberley for 2030 is limited to a set of good intentions without any quantification of actual needs, and without any implementation of the existing studies. All these results show that the possibility of development are extremely reduced, contrary to the popular belief that “the North is the water reserve and the next food bowl of Australia”. Such an statement, linked to the economic myth of ‘job creation’, collides with the evidence of the scarcity of water in those regions. Solutions do exist, but only for small, clearly identified and thoroughly investigated areas, and only by involving all the stakeholders, in particular the Indigenous population (people of Aboriginal and Asian origin). This recent document emphasizes the importance of water management, the limits. At the same time, quantitative studies cited remain unpublished, unpublished (CSIRO 2015c, unpublished, p.184; C. & Petheram al.CSIRO 2015, unpublished, p.190). We observe a contradiction between wanting to grant “water rights” to attract industrial, and variability of the same water resource. If science is there to help responsible planning, it would be important to publish the unpublished studies, disseminate the results of Nasy NAWFA and studies, and draw recommendations on the use of water (unlike Figures 22a and 22b above -Dessus). This is a big difference between Australia and France. 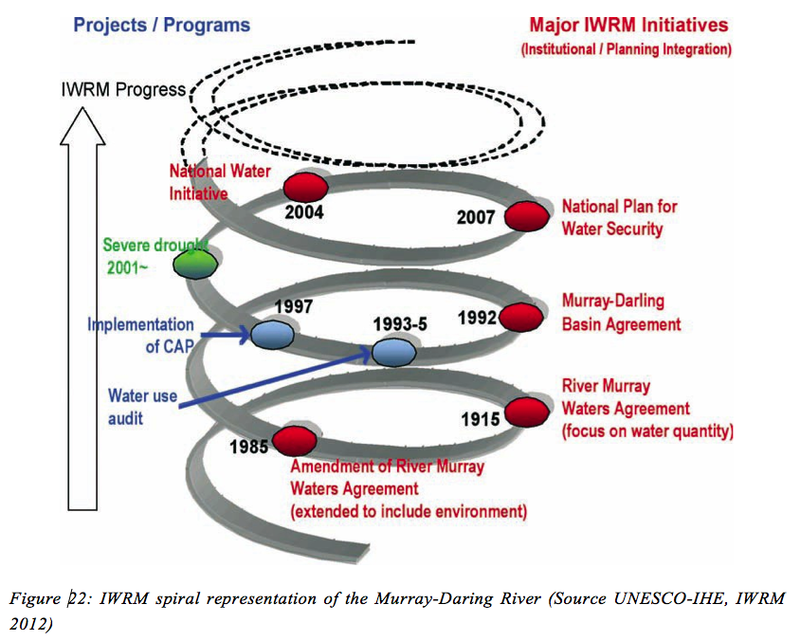 France, through the Basin Agencies of organization (which can be compared with MBDA-Darling Basin -Murray Agency-) anticipates problems, and links between the actual water resources and the willingness to Economic Development. The two approaches are quasi totally separated in Australia and the consultations made to adopt a plan on water (Kimberley 2010-2030), etc …) have no economic encrypted data or by map. The “strategy map” of the Kimberley Regional Planning and Infrestructure Framework (2014) is particularly imprecise, fragmented or both. No link is made with the Local Plans Urbanisle, it lacks an intermediate scale study, the scale of 32000 km2, which we call “convivial regions”, or “Study regions”. The White Paper therefore sets ambitious targets which we already know they come into confrontation with the NASY and NAWFA studies described below. 2.C.5. Description of “silos” (Mines, water, urban planning, shale gas, Agriculture,…). What are the needs? Another study on the social impacts of the mining industry shows how Aboriginal people from the Pilbara region are among the poorest in the world. That is why when the Kimberley is presented as the “new Pilbara” (and also as “the new Dubai”), a majority of people voice their concerns: because of the mines, housing prices are increasing, the population is getting poorer, there is an increase in the number of homeless people, Aboriginal people are excluded, and therefore there is also an increase in violence, addictions, and imprisonments. The jobs are predominantly made up of FIFO workers (“Fly in, Fly out”), and the towns which have been created become ghost towns after 20 years (Reference event n°3). 2.C.5.2. The impacts of Mining.